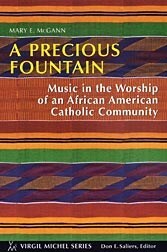 A Precious Fountain is a work of liturgical ethnography that probes the rich liturgical life of one worshiping community whose roots and practices are at once Black and Catholic, using music as a primary lens through which to explore the community's liturgy and embodied theology. Our Lady of Lourdes community in San Francisco is part of a larger event in the American church: the emergence of a new paradigm of Catholic worship, one that is "authentically Black and truly Catholic." Mary E. McGann, RSCJ, describes how the music worship of Our Lady of Lourdes in San Francisco not only enriches that community but also is an example of how a theology of music is practiced in that parish. She offers this new genre of liturgical literature that brings to light how Gods Spirit is working in the churches through the idioms, perceptions, and insights of specific ethno-cultural communities in this time of massive cultural change and globalization. Mary E. McGann, RSCJ, PhD, is assistant professor of liturgy and music at the Franciscan School of Theology at Berkeley. She is the author of Exploring Music as Worship and Theology and co-author with Edward Foley, Capuchin, of Music in the Eucharistic Prayer published by Liturgical Press. This book will be useful to anyone who wants to know more about current liturgical research and scholarship, about music as a bearer of theological meaning, and about liturgical practice in Black Churches. One of its many strengths is the way the unfolding of its dramatic story draws the reader into experiencing `one community's regular encounter with the living God, mediated sacramentally and liturgically through their being the "church" assembled' (p. xix). With respect and affection, and by means of liturgical ethnography, McGann has undertaken a deep probing of the `structures of thought and feeling that shape [this community's] sense of divine mystery, [and] of [the] self-identity and relationship that are foundational to their worship' (p xvi). Precious Fountain is a text worthy of serious consideration for students of liturgical theology both new and old. It acclaims the contributions and insights of this African American Catholic Community to authentic music-worship practice and invites further dialogue and mutual exchange between the particular and universal church.